Mr Romney, who stood and lost for the Republicans against Barack Obama in 2012, suggested in an article that Mr Trump was not fit to be president. Mr Trump had not “risen to the mantle”, he wrote in the Washington Post. At a White House cabinet meeting, the president said he hoped the incoming Utah Senator would be a team player. 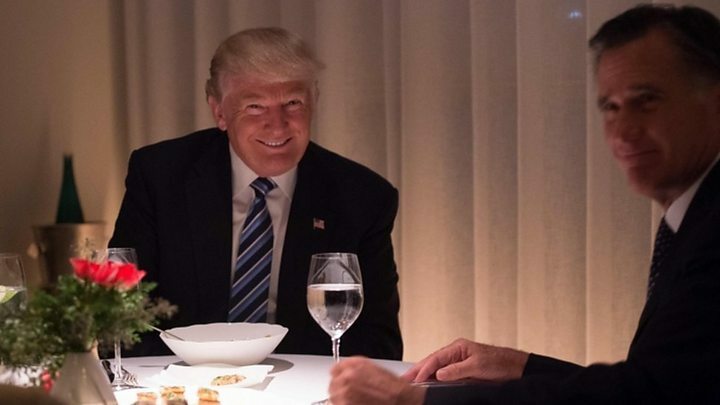 Mr Trump said he was “surprised” Mr Romney criticised him so quickly, adding that “if he fought really hard against President Obama like he does against me, he would have won the election”. Mr Trump drew a comparison with Jeff Flake, an outgoing Republican senator who also attacked him last year. But the president sounded conciliatory, calling for Mr Romney to be a “team player”. The timing of the article, just two days before Mr Romney is sworn in as senator for Utah, has prompted some to speculate he is positioning himself as a challenger to Mr Trump for the Republican presidential nomination. In the article, Mr Romney praised many of Mr Trump’s policies, such as his tax reforms and appointment of conservative judges, and his crackdown on “China’s unfair trade practices” – polices which he said “mainstream Republicans” had promoted for years. The world “needs American leadership”, he argued, and “the alternative… offered by China and Russia is autocratic, corrupt and brutal”. A fight for the future of Republicanism? The on-again, off-again feud between Mitt Romney and Donald Trump is back on, although the president – for the moment – is shying away from open warfare. That’s a bit of a surprise, given then-candidate Trump unloaded with both barrels in 2016, when Mr Romney called him a fraud and a phony who should be opposed at every turn by Republican primary voters. Perhaps the president realises he needs all the support he can get in the Senate, where another outspoken Republican, Jeff Flake, recently turned disapproving rhetoric into actions that stymied administration priorities. Mr Trump would much prefer the new senator from Utah to follow the lead of other Republicans, who have paired the occasional criticism with lockstep support for the White House’s agenda. That may not be Mr Romney’s game, however. Whether he is positioning himself to pick up the pieces after a possible Trump tumble or, perhaps, simply serve as a check on what he sees as the president’s more dangerous impulses, the timing of this op-ed suggests this is an opening shot. The two men in many ways represent the past and the present of Republicanism. Now they could be about to fight for the party’s future. How have other Republicans reacted? Ronna McDaniel, chairwoman of the Republic National Committee and a niece of Mr Romney, described her uncle’s article as “disappointing and unproductive”. Mr Trump’s manager for the 2020 presidential campaign went so far as to accuse Mr Romney of jealousy. Former White House press secretary Ari Fleischer said he was also “disappointed” in Mr Romney. Meanwhile, the New York Times, the liberal daily regularly attacked by Mr Trump, commented that much of the essay “sounded like the makings of a primary challenge against Mr. Trump from Mr. Romney”. A complicated one. During the 2016 campaign, Mr Romney said Mr Trump had neither “the temperament nor the judgement to be president” while Mr Trump called Mr Romney a “choke artist” and called his bid for the presidency in 2012 “the worst ever”. When the US Congress reconvenes on Thursday, Mr Trump faces a new challenge on the domestic front – in November’s mid-terms the Republicans strengthened their hold of the Senate but lost the House of Representatives.